Molly Burt-Westvig is an Iowa City based painter who uses bold gestures and vibrant colors to translate experience and reconnect with the natural world. In 2016 she was an artist in residence in Iceland where she made a formative body of work studying and exploring glaciers inside and out. Her work since has focused on how technology and luxury impact our relationship with the natural world, reflecting upon the conventions of landscape painting while exploring its role in the 21st century. 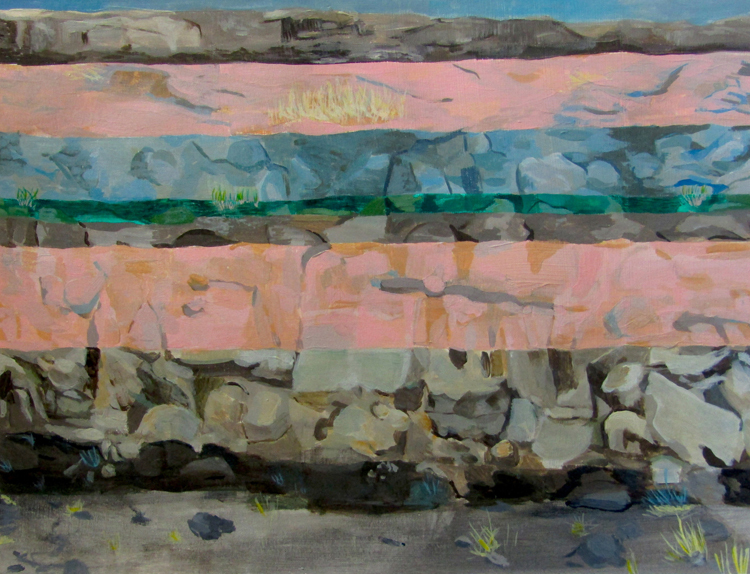 I paint as a means to preserve the environment, both in making a physical record of the landscape and by advocating for it with visual language. Depicting the landscape in any form creates a sense of escapism; it stirs up all the experiences that happen when we step outdoors and away from technology. As a Midwest based artist who focuses on environments, I collect massive amounts of imagery for reference in my work: postcards, brochures and travel photos become source material for painting, often painting places partially imagined and very far away. The intermingling of digital and traditional sources, the experienced and unknown, translates into degrees of abstraction within my work. Geometry is a consistent element of my compositions, creating dynamic shapes and framing devices, which create both windows into and walls from the constructed worlds on the other side.